Audiovisual design with Max/Msp/Jitter workshop by Marco Accardi and co-hosted by VJ London. 6 & 7 April 2019 at Stour Space. 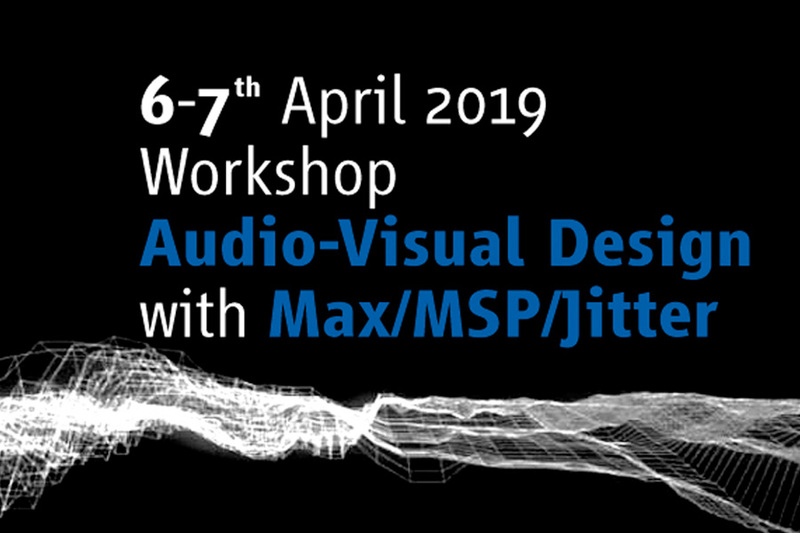 That course is an introduction to Max/MSP/Jitter and how to create an interactive audiovisual set. You will learn how to work with a matrix, generate 3D shapes and use an audio signal to manipulate video effects. laptop, headphone, max8 installed (https://cycling74.com/downloads) (free version for 30days) , midi controller (if you have one). Marco Accardi (1989) is multidisciplinary artist based in Berlin, who works in the field of electro-acoustic music, dance-theater, audiovisual art, installations and producing electronic music. He teaches sound design with max4live (additive, subtractive, granular synthesis and delay processors) and visual art with jitter (matrix, openGL, pixel displacement, audio-reactive objects). He has been using Max for almost 10 years and he has developed devices and softwares from Max mainly for electro-acoustic pieces. He is working now on a software for advanced audio spatialisation management and an advanced glitch machine device. Marco has studied electronic music with Emanuele Casale at the “Conservatorio A. Scarlatti di Palermo”, achieving a diploma with honours. As a member of MiniM Ensemble, since 2012, he develops software and does live electronics for electro-acoustic music pieces by K. Stockhausen, L. Berio and L. Garau. As well as he has curated the installation of an acousmonium of 33 loudspeakers at “Festival di Musica Contemporanea di Cagliari” in 2014 and 2015. He has given lectures about electro-acoustic music and programming at University and Conservatory in Italy. Between the years 2015 and 2016, he has worked with Teatro Zappalà Danza” as composer and performer. In 2017 he got involved in the GAU Company as a sound designer, composer, performer and engineer. He has worked also with independent choreographers, presenting his works at Romaeuropa Festival (2016) and in several cities in Italy. In 2018, as a sound designer, Marco has participated at Kyiv Lights Festival (UA). As live electronics performer, he has played alongside Georges-Emmanuel Schneider at Spektrum in Berlin and at the “Musik Hochschule für Musik und Theater” in Munich (DE). As an audiovisual performer, he has played at CTM Festival in Berlin (DE) and at LPM in Rome (IT). As an EDM producer, he has released his music for labels like Encrypted Audio, Subaltern, CueLine, Surfase, Version Collective, Instigate. He has also performed his music in Italy, Germany,Denmark, United Kingdom, Estonia and Portugal. time we are going to work on the same visual source in order to help the students to understand better the video processing. During the practice, the students will experiment with the techniques learnt with the support of the tutor. Introduction to Max, matrix and the Vizzie Library. Brief introduction to the history and the workflow of the software; general overview of the type of objects to use in Max. The students will learn how to work with the Vizzie Library and create their own first visual set. description: how to display, record and process videos; objects: mathematical operators, matrix. description: how to display, record and process videos; objects: video player, webcam graber, video recorder, video effects. – create a personal visual set using the techniques learnt. generate and manipulate 3D geometries. 3. The MIDI mapping and automations. Description: how to control multiple parameters with a MIDI controller; objects: MIDI protocol, control numbers, MIDI device configuration, bpatcher, automations. Description: generation and distortion of 3D geometries; objects: 3D geometries, matrix operators. – configure your MIDI controller for a personal visual set. Control visual by sonic events. 5. Interaction between Audio and Visual. Description: how the audio signal flow works in Max and how use it to control visual; objects: DA converter, amplitude, audio-data conversion, datavisual conversion. – implement visual reactions by sonic events for a personal visual set.